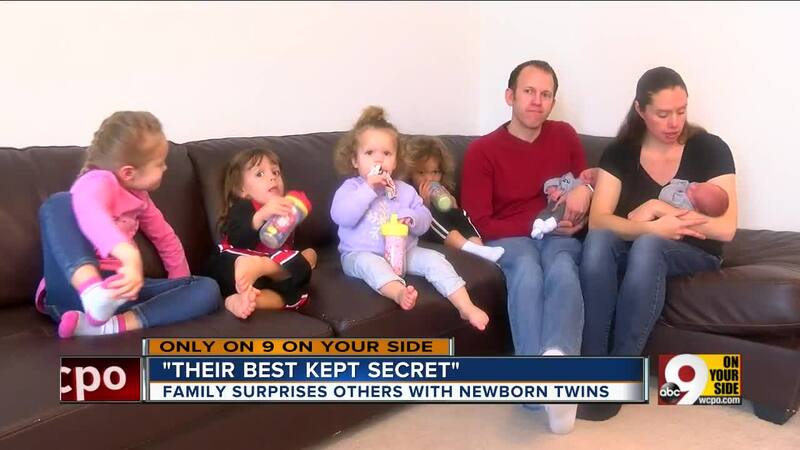 When parents Missy and Charlie Mirus learned that they would have a second set of twins, they decided to keep it a secret from everyone. When they shared the good news with their family and friends, they recorded the reactions and shared them all in a YouTube video that's gotten more than 1,600 views in just a few days. BLANCHESTER, Ohio — Getting around can be a challenge for one Blanchester family, after the parents of a 4-year-old, 3-year-old twins and 19-month-old had a second pair of twins. Even the hospital staff was in on it, Charlie Mirus said. "They were amazing" at helping with the plan, he said. "Seeing everybody's reaction was so cool, because we were able to do it different ways — in Facetime, do it in person, able to have people close their eyes and put the babies in their arms," he said. That's why babies Mario and Marco have outfits saying they're the "best kept secrets." "It was well worth it," Missy Mirus said. "I would say that we'd do it again, but people might expect it." The parents went through several fertility treatments in order to have their family, Missy said. Now, they use a six-person stroller and a 12-passenger van to get around. As if taking care of six young children wasn't a full-time job in itself, both parents are also middle school teachers. But would they have more children? "I don't think that we know at this point if we're going to have more or not," Charlie said. "We look at all of our children as a blessing. I don't think we'll ever prevent it."